Forget Bake Sales: Schools Turn To Luxe Auctions Cash-strapped schools across the country are staging swanky events to auction off everything from weeklong Italian vacations to an unwashed Lance Armstrong jersey, which sold for $110,000. "Probably the strangest thing," says one auction organizer, "was the vasectomy for you and your cat." 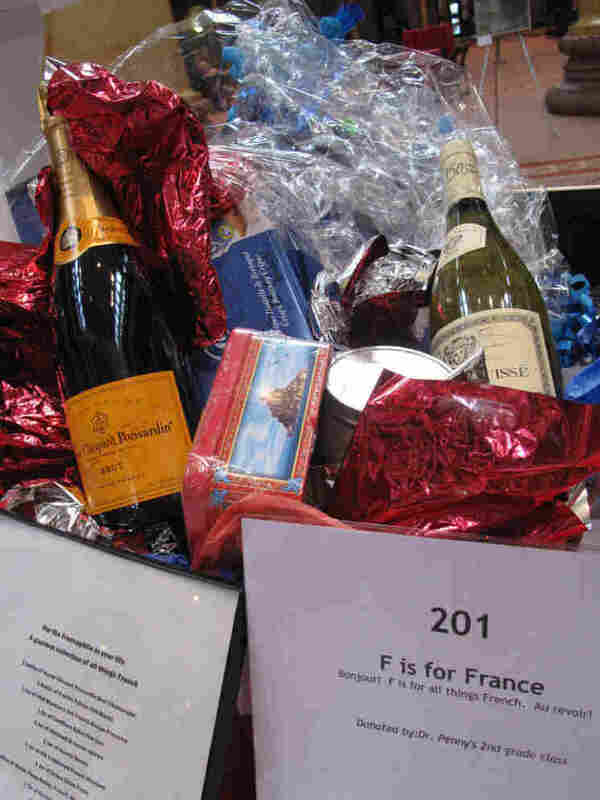 A basket of French items is showcased at John Eaton Elementary School's recent auction in Washington, D.C. Since the economy went sour and school budgets withered, school administrators and parents have been scrambling to come up with cash. Many of them are putting aside the buckets of cookie dough and pails of caramel corn in favor of glitzy, high-dollar auctions to raise thousands — even hundreds of thousands — of dollars. Daniel Domenech, executive director of the American Association of School Administrators, says school fundraising has reached an unprecedented level of sophistication. "We now have many school systems around the country that have developed foundations ... and these foundations raise in some cases millions of dollars," he says. For parents at John Eaton Elementary School in Washington, D.C., afternoons making cookies for a school bake sale have evolved into nights planning auctions for hundreds of people. "It is more than a big wedding," says mom Karen Robinson-Ogbebor. "It is something I would never sign up for again, and [I'm] not even running the auction." But parents like Robinson-Ogbebor are willing to stay up late putting together catalogs and finding the perfect jazz band because the extra money means their kids get essentials like a music teacher, an art teacher, a playground and school supplies. In addition to recruiting parents for fundraising, many schools are hiring professional auctioneers to hype up the crowd and get people to spend more. But live auctions can be a gamble because mom or dad might have scheduled a play date, or could just be too exhausted to show up. That's where a site called "Bidding for Good" comes in. "We're eBay for charities," says the site's CEO, John Carson. Bidding for Good has run 3,800 online auctions for schools around the country, and Carson says it's raised a total of $45 million. And it's sold some pretty wild things. "Probably the strangest thing was the 'vasectomy for you and your cat,' " Carson says. "An unwashed Lance Armstrong jersey went for $110,000. We just auctioned off a flight in Harrison Ford's plane that went for something like $55,000." What Kind Of Message Are Auctions Sending? Extravagant live auctions and their online counterparts are just one component of the new school fundraising business. But like some of the other creative ways schools have found to raise money — think pizza ads on school buses or sneaker sponsorships — these revamped auctions have their downside. "Clearly what this does and will do is widen the gap between the haves and the have-nots," says Domenech of the American Association of School Administrators. "The schools that have the greatest needs today are your inner-city schools, where the parents obviously don't have the means to fork over the dollars that they wish they had in order to maintain a program." The other concern is that big-time fundraising sends local governments the wrong message. "Whose obligation is this?" Domenech asks. "Doesn't the government have the responsibility, which they actually do, to provide the quality education that the community wants? Yet it's not happening." So for now, schools are going to have to keep filling budget gaps by auctioning hot-air balloon rides, puppies and the occasional bike tour of France.